Colorful magnetic stripe function same with the black magnetic stripe, color magnetic stripe use Germany KURZ magnetic stripe, card also can encapsulate the RFID chip. 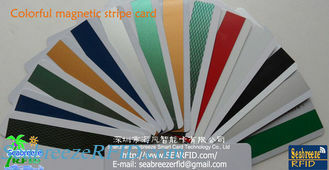 Magnetic strip color optional: gold,silver,black,brown,red,green,blue,laser,etc. Available chip: EM4102,EM4200,EM4305,TK4100,T5577,MF1 S50/S70,FM11RF08,NTAG203,Alien H3,Impinj M4,etc..
Others: Chip data initialization/Encryption,Personalized magnetic stripe programed,Signature panel,Barcode,Serial number,Embossing,DOD code,NBS convex code,Die-cut.